ZOR MY-SIDE1 Constant Velosity Side Draft fuel system. MY-SIDE1 new improved CNC machined block now shipping! Automation allows us to produce more faster! The reputation on the ORIGINAL CV kit is outstanding, Ask around. Thousands sold! The most recommended CV fuel delivery system for Suzuki Samurai enthusiast. If you do your research before you purchase it will be a evident that ZOR offers you the most, helps you the most, and helps you build your rig into the awesome ride you want it to be. MY-SIDE1 unique features include a water heated billet block for quicker warm up times. The custom angled chute feature for correct wet air velocity. 3" air ring that can be attached to your filtered DIY snorkle. Quick change out part to upgrade to the larger 44 mm carb and ZOR's most famous tech support. MY-SIDE1 kit includes what you need to get started at the absolute best value for your dollar. The complete ZOR/CV long choke cable assembly and correct 40 mm or 44 mm rubber boots, air filters to pressure regulators. The kit also includes the aluminum water heated billet block which is the main part to begin building your kit. Our heavy duty brackets support the carb, the air ring and pre-oiled paper element air filter in the most difficult terrain. The base gasket and block bolts, hoses & clamps, its all here, ready to add an optional CV carb. Used 1996-2006 carbs with black square floats are readily available in the $50 to $70 range at your local biker shops. They do go higher on Ebay. You can use either a used HD 40mm or purchase a new ZOR/HD 44mm CV carb and eliminate many used carb issues. 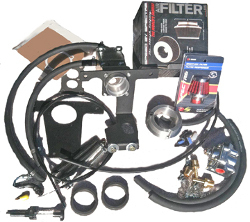 Any HD big twin manufactured from 1996 to 2006 came with the carb you need. The install instructions include simple and straightforward "how to" steps to modify the carbs for this application. Modification takes less than 40 minutes. DO NOT MODIFY YOUR CARB FROM A YOUTUBE VIDEO! MY-SIDE1 carb system loves the Suzuki engines, it makes the 1.3 & 1.6 come alive. Rapid acceleration and quick throttle response. Improve mpgs compared to those large bore and worn out old carbs. This bolt on system does not require removal or the 1.3 intake manifold from the head. The 4 intake carb studs must be removed. It can run either mechanical or electrical fuel pumps. Mechanical is recommend but some heads are efi and you gotta go e-pump. * Sold as OFF-ROAD ONLY! No claims are being made that the MY-SIDE1 will pass emissions in any jurisdiction requiring emissions certification! NOTE: Body lifts where the body is higher off the frame than OEM may require that the installer re-routes/modifies their own supplied air filter and connection to the CV carb. SPECIAL NOTE: I REALLY HATE TO DO THIS BUT I NEED TO WARN EVERYONE THAT THE $80-250 HARLEY DAVIDSON CARBS ON EBAY ARE NOT A REAL HD CARB MADE BY KEHIEN. IT IS A VERY CHEAP CHINESE KNOCK OFF. DO NOT PURCHASE THAT 40 MM CARB. READ HIS THREAD IT SAYS "FITS" A HARLEY DAVIDSON! OEM in this case is NOT original equipment manufacturer. It is named to deceive you. * For no additional ,over the phone, ZOR insists on going over your used carb to make sure it is acceptable to attempt an install. Genuine HD parts are required so those are checked during the tech call. For a $45 ZOR will rebuild your carb and modify it for this kit, any parts the carb needs will be extra. Please tell your friends about the MY-TURBO kits made specifically to boost the MY-Side brand CV kits. These products and services are available at all ZOR vendors.